Neither man nor woman can live solely in Bushwick. While it's easy to feel like we have everything we need right in our own backyards (art, film, music, food, drinks, yoga, etc. ), we also spend a lot of energy expanding our boundaries to welcome other neighborhoods and boroughs into the mix. This weekend offers a great opportunity to see the artists and gallerists of Bushwick doing what they do best both in and outside the neighborhood. In true Bushwick fashion, the events this weekend are all over the map, both literally and thematically. After starting in the neighborhood with a few local events, don't stop there! Come help us support our artistic community as they bring what they do to a broader audience. The new exhibition at TSA in Bushwick offers a continuation to their sister space, the original Tiger Strikes Asteroid in Philadelphia, and will showcase the art of some of its Philly members, Jaime Alvarez, Keith Crowley, Rubens Ghenov, Alexis Granwell, Ezra Masch, Nora Salzman, Caroline Santa, Theresa Saulin, Anne Schaefer, and Douglas Witmer. The collaboration between the two spaces is one of the things that makes this gallery unique; rather than simply acting as two separate outposts under the same umbrella, the two spaces collaborate and create opportunities for their artists in both cities to reach across state lines, creating a cultural exchange and therefore enriching the art of all of the artists. 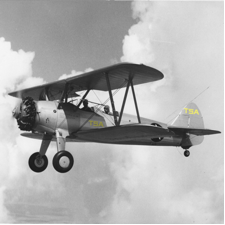 Correspondence II responds to their exhibition, Correspondence I, where TSA's New York artists travelled to Philadelphia to showcase their work there. Last night Pocket Utopia unveiled a new work by Brooklyn-based artist, Matthew Miller. 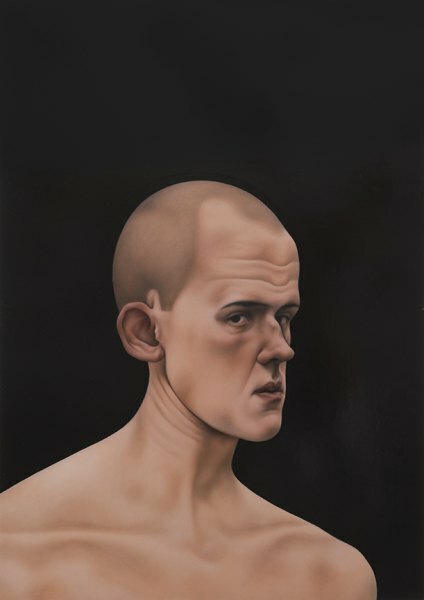 Miller has shown his work extensively within Bushwick and is now represented by the Lower East Side gallery. Known for his Manet-esque stark and confrontational portraits, many of which are self-portraits, Miller's work has a subtle power that unnerves the viewer in its perceived simplicity. Typically devoid of a background, Miller instead opts for completely bare black or white backdrops for his subjects, which forces the viewer to connect gaze with the subject, leaving no other distractions to detract from the figure. In a time and a city when our lives are filled with overstimulation and we are forced to divide our time between many tasks simultaneously, take a minute to experience the directness of Miller's paintings that force you to slow down and even stop altogether. Come experience music, performance and video all under one roof of Fitness Center for a night of sensory stimulation and improvisation. The full bill of artists working in a variety of media is sure to provide a full night of excitement and surprises around every corner. The Fitness Center's mission is to create experiences where they successfully conflate sound, visual and performance art to create a unique experience for all your senses. With over a dozen artists performing, sit back and enjoy, and let the experiment begin! Norte Maar kicks off their August outdoor dance series this weekend with the work of Julia K Gleich/Gleich Dances. For nearly twenty years, Julia K. Gleich has been bridging the gap between contemporary and traditional dance to truly capture the contemporary spirit in her choreography. 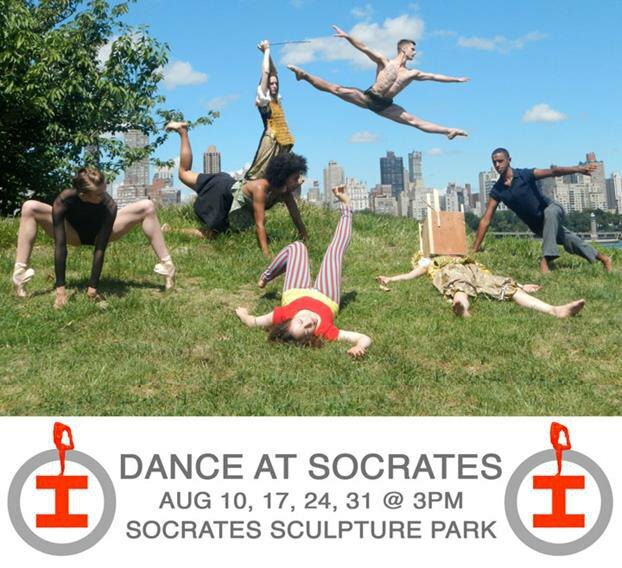 If you have not yet explored Socrates Sculpture Park in Queens, this is the perfect opportunity! Always known for working directly with artists to help them achieve their distinct vision, this summer the park welcomed Norte Maar Gallery in a collaborative dance residency at the park, culminating in this month's performances. In many ways the dancers will emulate the sculptures around them; they, too, will be influenced by the parks waterfront location and beautiful view of the city, and will utilize the park's landscape during the performance. This Saturday at 7PM, the public will gather in the center of Maria Hernandez Park to watch an original one-woman show by Daniella De Jesús about the gentrification of Bushwick, Brooklyn. "Summertime, healthier foods, nicer stores, cleaner streets, better apartment buildings, better train service, safer parks, less crime...But the heat is hot and tensions high as the rent," Daniela's invitation reads. 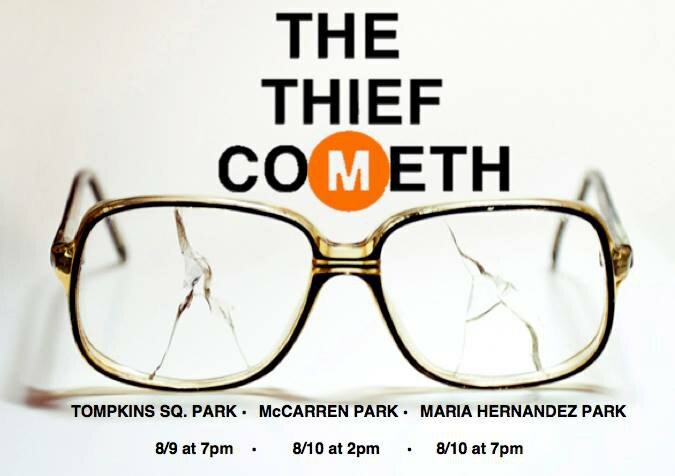 Presented by The Rooftop Collective, directed by Stephen Chacon, The Thief Cometh promises an interesting evening!